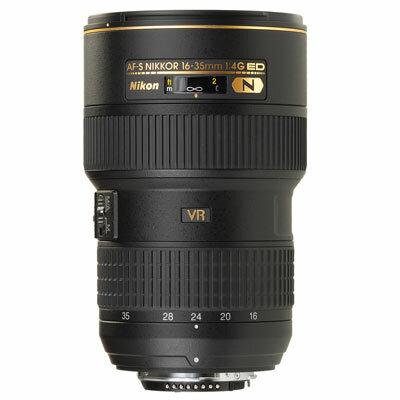 The Nikon AF-S Nikkor 16-35mm 1:4G ED VR comes in as the first wide-angle lens featuring optical image stabilization while slotting in as a more cost-effective solution to the 17-35mm 1:2.8D and 14-24mm 1:2.8G. The image stabilization means a bigger and heavier lens, but also a more complicated glass set up with more elements. With a quality build, weatherproofed and the promise of superior image quality and VR, could this lens shape up to be one of the best wide angle zooms? The 16-35mm has much more glass than you would expect from a wide-angle zoom. 17 elements in 12 groups, with three aspherical elements, being made from Extra-low Dispersion (ED) optics. Nano Crystal coatings are used to reduce aberrations and flare. The spec sheet has some quite impressive features. The focal length of the lens are 16-35mm or 24-53mm on a crop sensor, with an aperture range of f/4-f/22. There are also nine rounded diaphragm blades which should produce some nice bokeh when needed. The AF motor is a ring type ultrasonic, with full-time manual focus, also in A/M and M/A modes. The image stabilization claims to give you four stops of leeway, which is around the mark provided by other manufacturers with their own versions of VR. The filter thread size is 77mm and does not rotate when focusing. All the focusing on this lens is done internally. The lens barrel is made from thick, durable plastics with a magnesium alloy internal structure. The layout is simple and straightforward with the a zoom and focus ring, image stabilisation and focus switches. There’s also a small distance scale in both feet and meters. This is a chunky lens and feels like a quality addition to any camera body. Attach the petal-type HB-23 hood and it definitely looks a sizeable item. All this comes together in a package of 685g (1.5 lb) at 3.2 x 4.9 inches and comes with front and rear caps, HB-23 Hood and CL-1120 lens pouch. Both DX and FX bodies can enjoy this lens. There are differences in the results on both formats, as we shall see. On a DX body the lens is very sharp, even at f/4, but when at the 35mm edge of the range, images look sharper at f/5.6 and above. Chromatic aberration and distortion are only seen in very small amounts. Fringing comes in when you’re really wide-angle and the lens only shows a little bit of pin cushioning around 35mm. If needed, you can get close up with this lens to around 9 cm, but it wouldn’t be considered a macro lens. If you want to get some macro shots, you’ll have to go to somewhere near f/16 to make sure everything is sharp. On an FX body it’s native format, is where the lens shines the most. Sharpness is great, apart from at 35mm which shows some edge softness. Generally, going to f/8 makes sure everything is sharp as it can be. There is more pronounced barrel distortion at 16mm, which can become quite heavy at times. Luckily, loading the camera type into Lightroom cured this problem, but i would prefer not to use software to remedy these type of problems. Lens flare can be an issue with wide-angle lenses, attached hood or not. With this lens, flare is manageable when the light source it’s out of frame. Once in frame, flare is evident with it being the most obvious at f/11 and above. f/4 blurs things out for you, but not to a great extent. Fringing and chromatic aberration are thankfully minimal and the small amounts can be easily rectified in postprocessing. The barrel distortion at 16mm is the same as on full frame. There’s definite pronounced bending of straight lines at the widest focal length. Not exactly what you want when taking images of architecture, but you can at least apply the lens correction filter in Photoshop or load in your lens profile in Lightroom. With a wide-angle lens it’s not exactly the best solution as the postprocessing can slightly soften edges, but this is only minimal. There’s also a little edge softness at 35mm when fully wide open. Going to f/8 cures things. The big release for this wide-angle lenses is the VR II vibration reduction system. This is claimed to give you four stops or shutter speeds down to around 0.8 sec. The system is nearly silent and does a great job in lowlight conditions. It’s a definite bonus feature that works great. A wide-angle lenses isn’t the most obvious choice for image stabilisation, but you definitely get the peace of mind of a high hit rate in lowlight conditions. The Nikon AF-S Nikkor 16-35mm isn’t the only wide-angle zoom option for your Nikon camera body. The AF-S Nikkor 17-35mm F2.8D ED and AF-S Nikkor 14-24mm F2.8G ED are both worthwhile contenders, but they don’t have VR image stabilisation. Both of these do have the advantage of f/2.8, but cost a lot more. Another comparison is the Sony Carl Zeiss 16-35mm F2.8 SSM which lets in more light with f/2.8, is a much heavier lens and doesn’t have image stabilization. 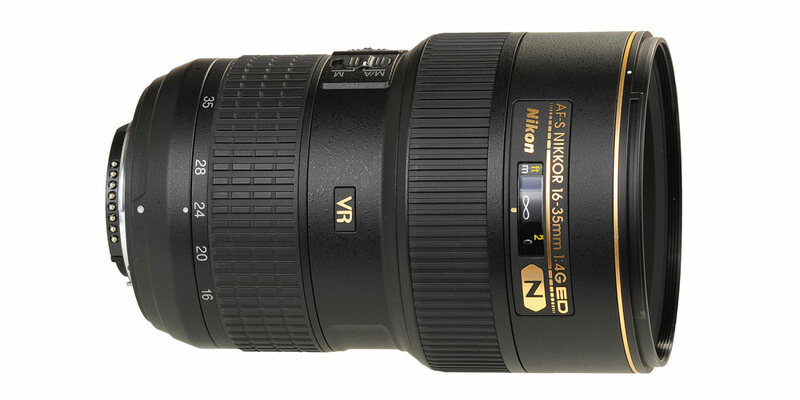 The AF-S Nikkor 16-35mm F4 VR is a great wide-angle zoom, but it does have some caveats. Image stabilisation is clearly a great bonus feature and on a wide-angle can get you some really low shutter speeds. Images are centrally very sharp throughout the aperture range, with only a small amount of softening on a full frame body, especially when at its widest. If you’re happy to be at f/8 and above, you will get fantastic images across the focal range and with the peace of mind of VR, you’re going to get some high quality images and a big hit rate. Surprisingly, there’s a lot of barrel distortion at 16mm on a full frame body. Easily corrected in postprocessing, but software will always be second best to correct images out-of-the-box. The other Nikon wide angles may be f/2.8, but this edition comes in at a lighter weight and more cost-effective. With the addition of accepting filters, VR and a usable zoom range makes this a quality, wide-angle zoom. Apart from the 16mm barrel distortion, this is recommended lens.